Obituary – Pricer, Loren Wayne « Perry High School Alumni Association, Inc.
– son of H. O. Pricer, was born July 21, 1923 in Perry and has lived in this city all of his life thus far. Loren has attended the Perry schools for 12 years, and has been active in football, basketball and track. He is a one-year letterman in sports and also won a manual training award during his sophomore year. He collects match covers, spoons, pennants, and what not as a pastime. His plans following graduation, are still undetermined. Loren Wayne Pricer, 95, of Perry, Oklahoma, passed away peacefully at home on November 28, 2018. He was born in Perry on July 21, 1923. Loren graduated from Perry High School in 1941, and soon afterward, left for California where he got a job building crates for storing lettuce and oranges. When he saw the movie “Wake Island”, it prompted him to enlist in the United States Marine Corps. 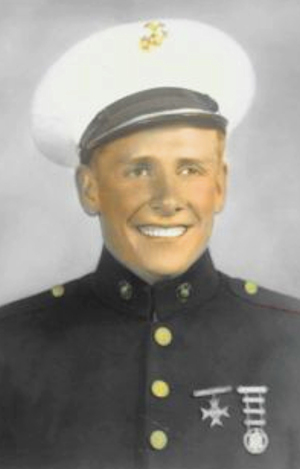 He served during WWII, mostly in the Pacific and was on 19 different ships. He was in action at New Guinea, Cape Gloucester, Peleliu Islands, Okinawa, Ryukyu Islands, and China. He was awarded the Good Conduct Medal and received several citations of merit. After his tour, Loren returned home to “dear ol Perry”. He said “it looked better than ever.” Loren considered it an honor to have served his country in the U.S. Marine Corps. After his military service, Loren worked in general construction for 45 years as a superintendent and project manager in several states for R.K. and A. Jones Construction based out of St. Louis, and then the Pynn Companies based in New Hampshire. He retired and moved back to Perry in 1990. Loren loved to play golf, snow and water ski, enjoyed hunting and played on a semi-pro fast-pitch softball team, that made it to the fast-pitch world series, 15 years in a row. He was an avid sports fan, loved cheering for the OSU Cowboys and attended many basketball and football games in Stillwater. Loren was a long-standing member of the Benevolent Order of Elk’s and the American Legion. 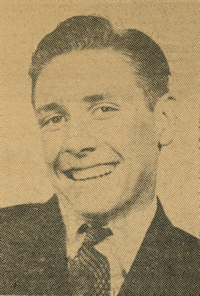 Loren is preceded in death by his father, Henry Oswell Pricer, and mother, Lottie (Haskell) Pricer; his three brothers, Willy Pricer, Darrell Pricer, and George Pricer; his two sisters, Ilene Mittasch and Clara Bunch; and step brother, Mickey Spicer. Loren is survived by his two sons, Larry Pricer and wife Patricia, and Lonnie Pricer, five grandchildren, Traci Meduna, Steven Pricer and wife Angie, Traci Hanna and husband Jack, Bart Waits and wife Kerri, and Mark Pricer; six great-grandchildren and one great-great-grandchild. Funeral arrangements are entrusted to Brown ~ Dugger Funeral Home in Perry, Oklahoma. Visitation has been scheduled from 10:00 am – 11:45 am with service to follow at 12:00 pm on Wednesday, December 5, 2018 at the Brown ~ Dugger Funeral Chapel with a committal service to immediately follow at Grace Hill Cemetery in Perry, Oklahoma.